Here’s a warm, satisfying soup for a full stomach. First you pan-fry the vegetables to enhance their flavors and get that delicious caramelized richness into the soup. Chicken stock and coconut milk give you the potential for a velvety-rich texture, and a spin in the blender makes it all come together in one belly-warming bowl. For pampering yourself through the tail end of flu season, you couldn’t get much better: not only is this soup full of healing homemade broth, but it’s also easy on a sore stomach and mild enough to eat even when you’re feeling down. And it freezes beautifully, if you have any extras to save for the next time there’s a bug going around. 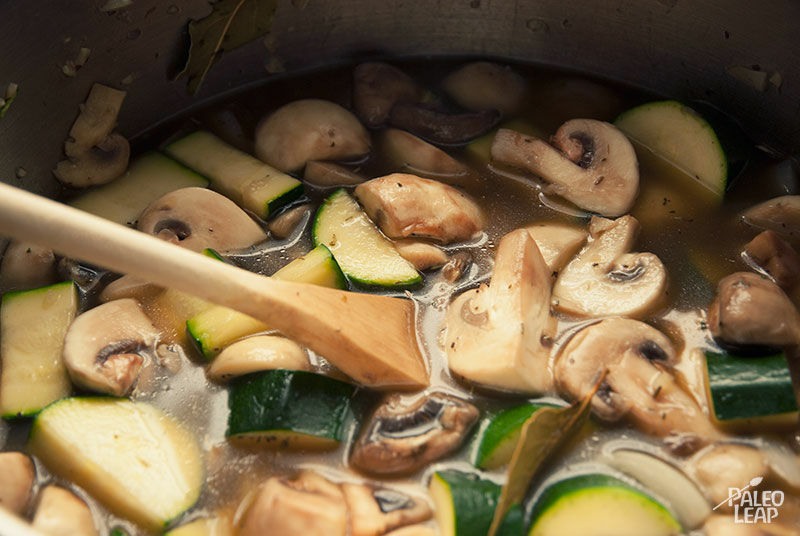 Another big advantage of this soup is how easy it is to fit into restricted diets. For example, if you’re on the autoimmune protocol just leave out the black pepper to make a nightshade-free recipe, and replace the ghee with coconut oil. The soup gets most of its flavor from herbs, so you don’t have to make many tweaks to the seasonings to get an autoimmune-friendly dish. Or make it vegan by using vegetable broth instead chicken stock, and coconut oil instead of ghee. 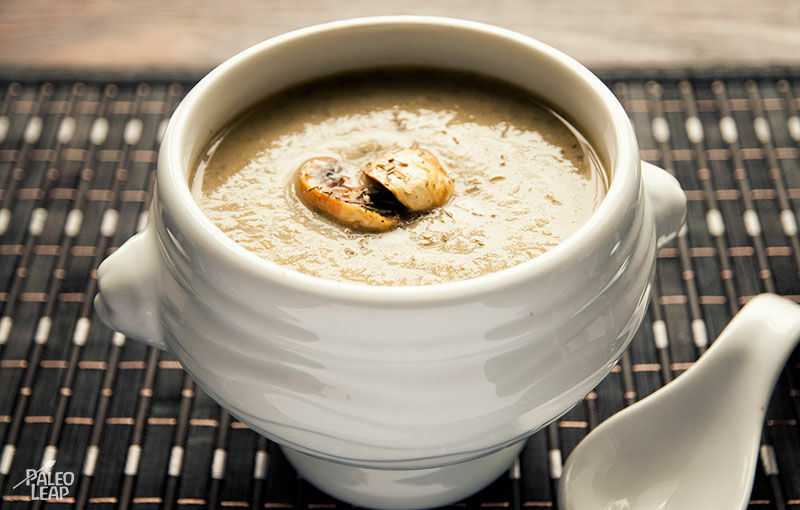 It’s a soup that can fit any demand – and however you tweak it, it’s sure to be delicious. Melt the ghee in a large saucepan placed over a medium heat and cook the onion and garlic until softened, about 5 minutes. Add the mushrooms, thyme, and bay leaves, and cook for another 5 minutes. Then add the zucchini and cook until the vegetables release their juices (about 10-15 minutes). Add the stock to the saucepan and bring to a boil; then reduce the heat and simmer for 5 minutes. Remove the thyme sprigs (if you used them) and bay leaves from the soup. Add the coconut milk and let the soup simmer for another 5 minutes, stirring frequently. Puree the soup with an immersion blender (or in batches with a regular blender) until smooth.